We are the Friends of the Southern Michigan Railroad. Help our organizations build a world-class railroad museum in Michigan. The Southern MIchigan Railroad Society was formed to save the Clinton Branch Railroad. 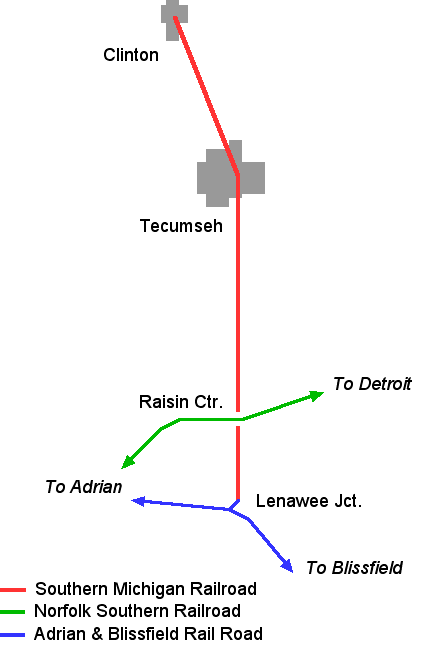 The oldest line in the state is the "Old Road" from Toledo via Blissfield to Adrian. The Clinton branch is the second line in the state, built to the county seat of Tecumseh in 1837. The line was extended to Clinton in 1853. The New York Central upgraded the line in the 1920s to excellent 105-pound rail. This means the roadbed is very forgiving, and with good maintenance, can accommodate any equipment likely to be preserved, from a Little Joe to a Big Boy. The railroad owns the entire line free and clear. There are no easements or reversion clauses or other limitations. Much of the adjacent lands are undeveloped. Between Clinton and Tecumseh, most of the undeveloped land was being quarried or planned for residential development. The real estate market has put that on hold. Friends' purchases will prevent development of nearly a mile of railroad frontage.